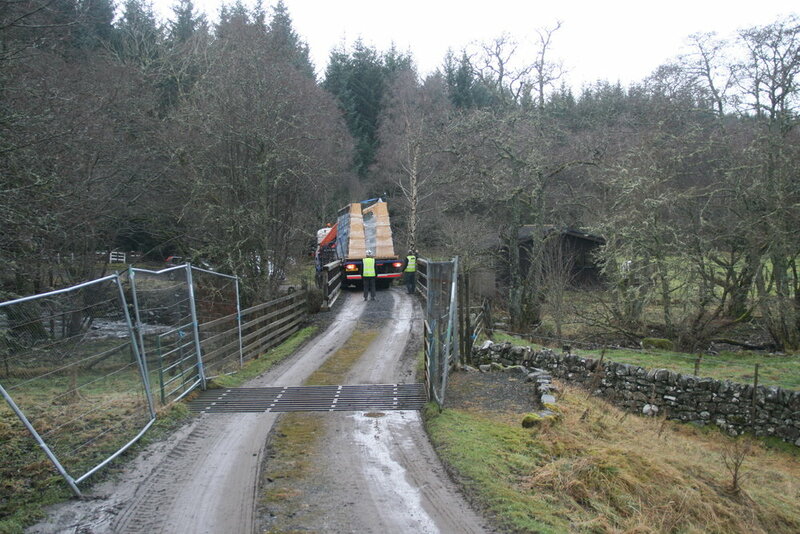 Our site visit this week was extremely wet and muddy as the snow and ice melts and the temperatures rise again. This is great for the building as it means the masonry works can push on. The beautiful Caithness stone walls have grown higher at the south end of the house and the first of the precast concrete cills from Lazenby concrete have been built in between the Caithness coursing. Before the very cold weather hit at the beginning of the previous week, those on site were able to pour the ground floor concrete screed. With the underfloor heating in, the building now has a chance to heat up and dry off and will soon be ready for the Dinesen floor boards to be laid. While the concrete was curing, work was able to progress on the first floor with the completion of the internal acoustic insulation and the fitting of door frames. Last but not least, despite the the ‘dreich’ Scottish weather outside we were really able to enjoy the corner view formed by the glazing in the kitchen. This has to be one of our favourite moments. The glazing has almost completely been installed and has had its ‘blue' protective film applied to avoid it getting damaged during the remainder of the works on site. The house is now another step further to becoming watertight which means works inside can move along quickly (it's great to be sheltered form the cold and wet weather they’ve been having). Another great joy to see on site today was the opening up of the double-height dining space. Now that the internal scaffolding has been removed the large areas of glazing at the upper level can really be appreciated and the views seem to go on forever. The kitchen is also taking its shape with its glazing now framed, along with the study which has been sheeted with ply. They are now laying the floor insulation down in preparation for pouring the concrete slab next week. 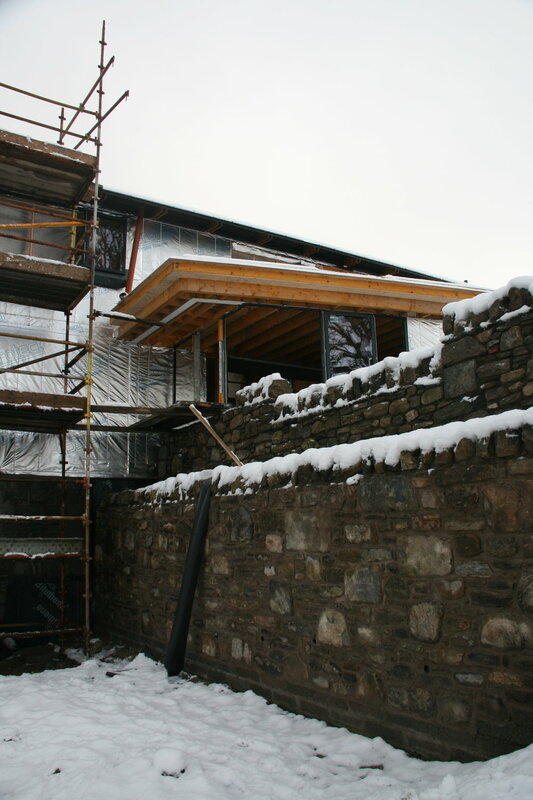 After the heavy snow and cold weather up at Tummel Bridge, the contractors have managed to install the opening Velfac windows and have made a good start on fitting the fixed glazing. This really started to emphasise the framed views and is another great step to making the house weather tight. During our site visit we were lucky to be able to see the delivery of the large curtain wall glazing panels and the initial fitting at the South gable. At the North gable we are already seeing a transformation in the living space with the removal of the temporary protective panels. We are very excited to see this space transform even further as the glazing is installed over the next few weeks. It was great to see the zinc roof now that its protective covering has been removed and the snow has melted. The two shades of grey resemble the colours of the water of Loch Tummel and from afar allow the house to really blend in with the surrounding landscape. Eaves details to what will be a green roof have now also been constructed which start to show the finishing profile, and the first fittings of the plumbing and electrics are almost complete. In addition, we were happy to see some more precast concrete elements from Lazenby having been delivered to site. The photo here shows some of the wall caps and window cills and the excellent sharp finish that we were looking for! 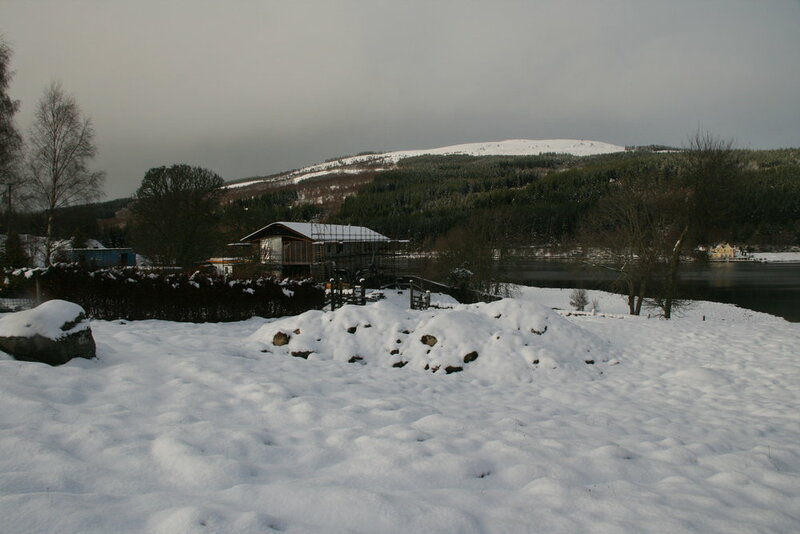 There has been very cold weather in Perthshire this past week and lots of snow on the ground on site. The weather has slowed down the on-site progress a little but they have managed to get the glazing channels in and some shaping of the flat roof. Unfortunately this weather is far too cold to continue with the masonry work so fingers crossed for some warmer weather soon! Frost on the ground at Mains of Kynachan today and the edges of Loch Tummel have frozen over. Despite the masonry work moving more slowly due to the frosty cold conditions on site, we were still able to see one of the carefully designed ends to the Caithness wall. 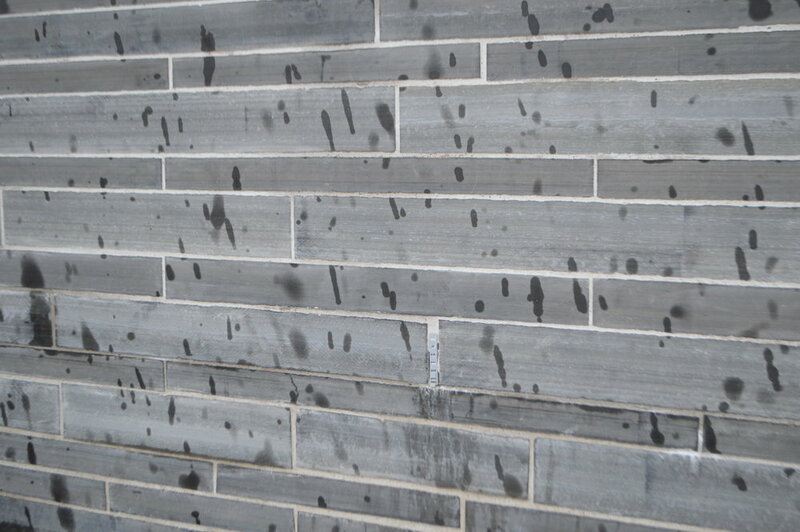 The single bespoke cuts of Caithness give a beautiful finish to the walls. The zinc to the eaves has been folded to form the bespoke gutters and is almost complete. The house has had a good chance to start drying out as it becomes well insulated, which also means the first fixes to the plumbing and electrics have been able to happen. Perhaps the most exciting part of our site visit today was being able to see the living room double-height space without any scaffolding! The space really opens up but feels very comfortable at the same time. Looking forward to seeing the structural glazing going in after the Christmas break! The first courses of the Caithness stone are up and they are looking beautiful on this wet but sunny day. The installing of the single zinc sheets to the roof is underway as the project moves another step further to becoming cosy and watertight. Further works to the drainage outside have been moving forward as the septic tank is in and the trenches for the pipework are excavated. Works have progressed on the oak outriggers, creating the overhang eaves and the cuts for the hidden gutters. A variation of a bespoke detail of ours on the White House but this time the roof and gutters are formed entirely out of zinc. 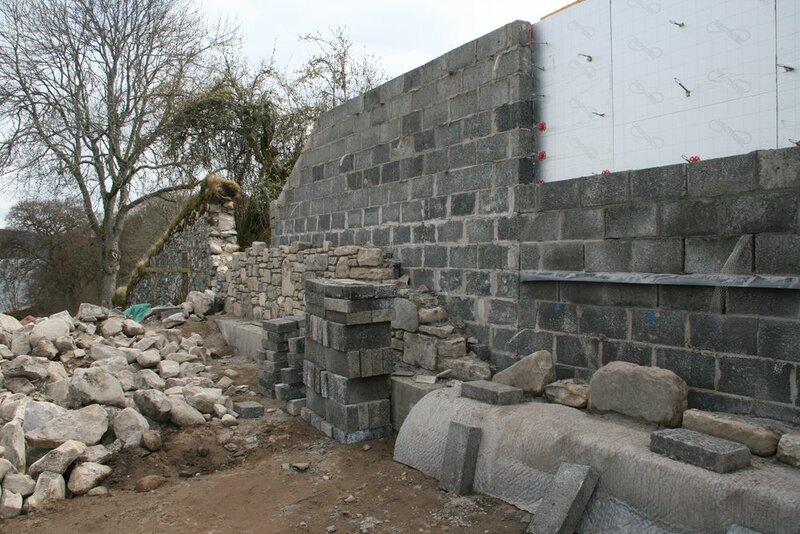 The rubble stonework to the North gable is looking good and ties in well with the existing old garden wall which used to connect to the old Byre. A big change since we last were up at Mains of Kynachan! The roof trusses have been fixed and the beautiful bespoke oak outriggers are in place, creating a fantastic rhythm along the eaves of the roof. The delicate curve of the ridge and the profile at the gables are really starting to take shape as the plywood is fixed with the underlay ready for the zinc to arrive. Joists to the kitchen, study and bedrooms are in and they have moved to the first floor to continue with the timber frame. Temporary scaffolding has gone up in what will become the double-height living room and dining room, allowing us to get up close to the steel frame and its gable steel ties. We’re also seeing some brilliant workmanship on the rubble stonework walls to the West terrace with the first copes going on to finish the edge of the planter beds. A glimpse through the opening of the utility room shows the ridges of the steading and the ever-changing-in-colour woodland to the North of Loch Tummel. More of the timber framing has been completed and their ready to move to the first floor. The sunny weather has allowed for more masonry blockwork to be built up, creating what will become the cosy hearth and bench in the snug. 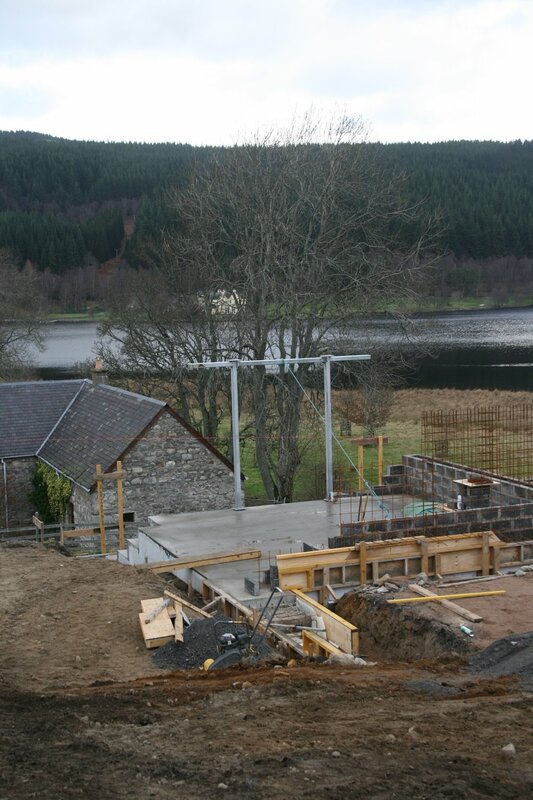 It was grey day up at Loch Tummel today but work was progressing well with the framing on site. The timber kit has started to go up and some of the framed views to the East have started to emerge. Great to also see the early beginnings of the hearth taking form and the rubble stonework looking good already. Spring and quickly morphed into full-blown summer in the past couple of months, with temperatures on site soaring up towards 30 degrees. The balmy weather has allowed pace to gather, and it was a delight to arrive on site and see a steel skeleton rising up from the hillside. The form of the house has become instantly legible, allowing our clients to better visualise the proportions and positions of internal spaces. Over the coming weeks, we expect to see completion of the masonry floors above the cellars and the steel framing joined by timber framing to walls and floors. Everyone is pleased to see the end in sight for the below-ground works. Before this can be fully realised, however, there is the small matter of dealing with the 100 cubic metre 'hole' in the hillside where the ground should have been. You always uncover unexpected things when you start digging around in the ground, and this project is no exception. Through the course of the subterranean works it became apparent that a large are of the original sloping landscape had been artificially created in layers over the decades (centuries!). Unfortunately, this 'made ground' is not suitable for building on, so the whole lot had to be excavated. To fill in the gap, 0.6m wide massive concrete walls had to be built underneath the line of the new building, before the area could be filled in with decent quality material. Elsewhere, it is great to see walls rising out of the earth finally, and even some stonework starting to appear! It would be fair to say there is a lot of reinforced concrete going into this project. The second tier of the cellar slabs was completed at the start of the month, allowing work to progress into the second half of the retaining walls. 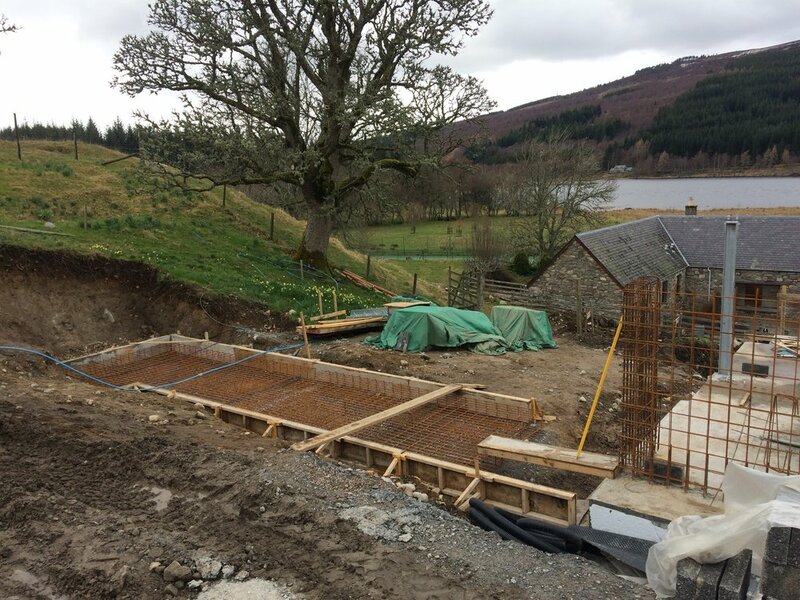 In the meantime, setting out of reinforced foundations for external planter retaining walls and the ground floor slab areas continue. Everyone on site is looking forward with hope to the arrival of Spring, and the rising temperatures it promises. February has seen tennis-court-sized sheets of tanking membranes installed ready for yet more acreage of concrete slabs to be poured. Work is simultaneously progressing to ground floor and basement areas. Where retaining walls have been erected, these are starting to be wrapped in their insulated, waterproof jackets. The spaces within the basement areas are now starting to become visible, almost half of which will become the climate-controlled wine cellar. Following completion of the lowest basement foundations, and whilst work progresses on the other subterranean areas, the first steelwork has arrived on site. The top of the 'goalpost' arrangement of steels shown in images above is a good guide for where the finished floor level will be in the ground floor living room. The view from the sofa is going to be stunning! Site Foreman 'Bobo' deserves special mention for the neat concrete detailing the highly complex stepped and chamfered foundations. Its almost a shame to cover it all up! 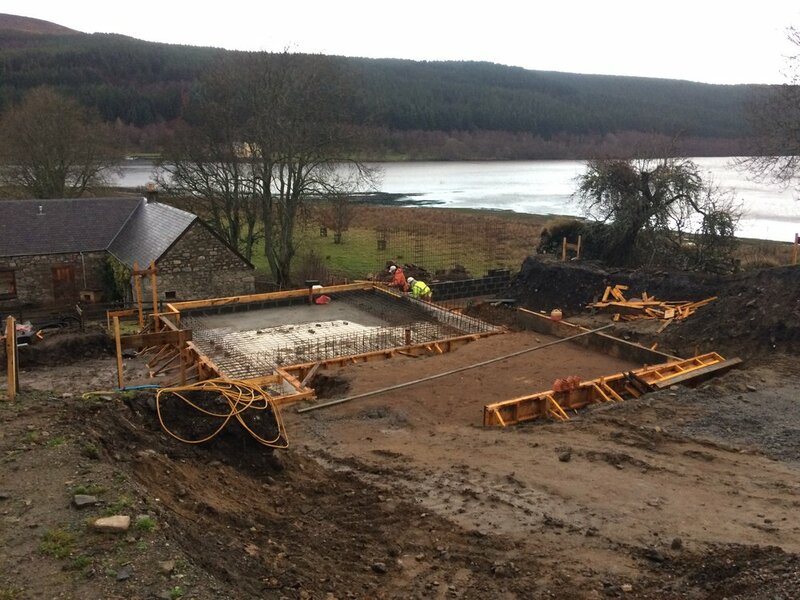 Throughout December work has progressed with setup for the first of the large reinforced concrete foundations, slabs and retaining walls forming the basement areas. Finding suitable weather windows has been tricky at times, but just before the Christmas break the first of the big concrete pours was pumped in. November has seen a vicious cold snap arrive in Scotland, with the mercury falling to -9 on some days. The contractors, kitted out in North Sea survival suits, have been managing work around the fluctuating conditions as best they can. Foundations have been commenced at the most northerly gable, and other excavations and service preparations are ongoing whilst the frosts persist. After the initial demolition phases of the project were complete, the negotiated contract kicked off in late October. The site has now been levelled, and preparations are already underway for the start of the extensive substructures. 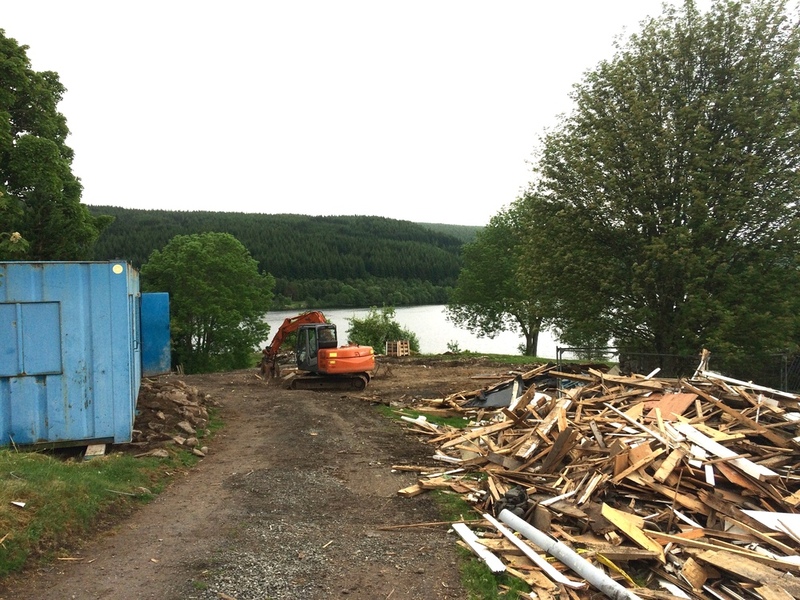 An eerily empty patch of dirt has now replaced the former farmhouse at Loch Tummel, following the completion of the demolition works. Although there is a twinge of sadness at the removal of the house and adjacent byre, there is now a real sense of the possibility for change and renewal. As much material as possible has been salvaged from the former buildings: roof slates carefully stripped by hand for reuse; stonework set aside for reuse in the new design; and timber salvaged and recycled by a local market garden. Works to the outbuilding continue to progress, with foundations, slabs and main external walls complete. 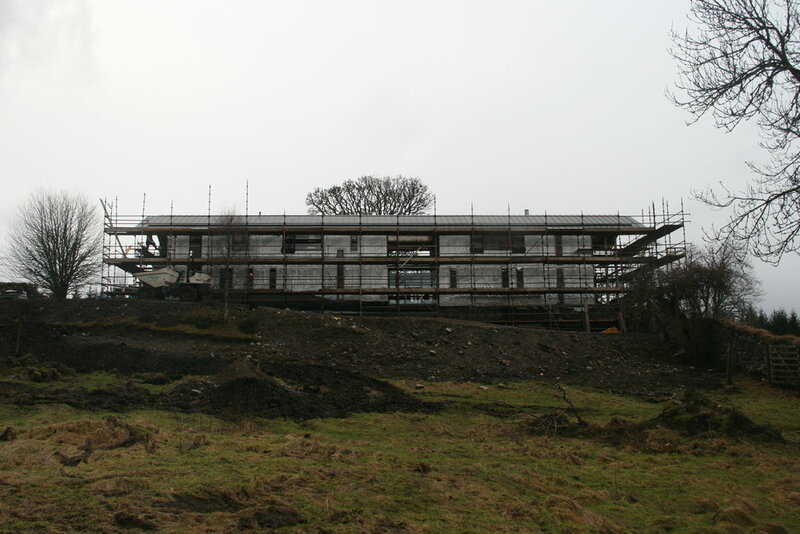 The next period will see the erection of the roof and start of the timber cladding.